If you’ve ever dreamt of being a Pig Farmer, but didn’t have the luxury growing up… now’s your chance. … but you will be playing alongside the smelly animals, in an effort to transfer their wealth – to you. The game’s fun, exciting, has great bonuses, and with a total jackpot of a whopping 360,000 coins, is tempting for all types of player. (Note: it doesn’t matter what the bet level/coin value is – it’s all relative to your stake, so don’t worry about trying to set things perfectly, just concentrate on your total stake, as that’s all that counts). 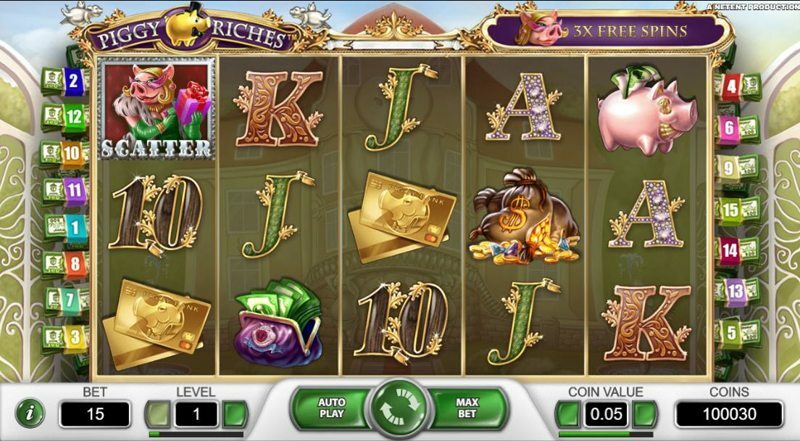 Using a fairly typical Net Entertainment layout, Piggy Riches is built on 5 reels, and uses 15 pay lines; these are not fixed, and can be changed, if you prefer. The game’s design doesn’t reveal much, but with the reels covering the majority of the screen; it looks like there’s some kind of Piggy Mansion in the background (probably the one displayed on the loading screen), although you really can’t see clearly enough to be sure. On the reels, you’ll find two types of symbols; first, the low-paying symbols, which are playing-card numbers, including 10, Jack, Queen, King, and Ace. The high-paying symbols include a Set of Keys, Bags of Gold Coins, a Piggy Wallet, and the Pig Symbol himself, that multiplies all wins by 3X. Piggy Riches is also available to players on mobile phones and tablets, and requires no software to be downloaded. iOS, Android, Blackberry, and Windows players will generally experience no issues loading and playing, but it’s always wise to play in Demo, or Free-play mode first, just to double check. Trigger the free-spins, and you’re in for an oink of a time. Land three or more scatter symbols to enter the free-spins, and before they begin, you get to choose from how many free-spins you want, with the multiplier attached. It’s possible to win up to 28 free-spins, with a 6X multiplier, and any wins during the bonus can go huge if you’re lucky enough to make 4-of-a-kind or 5-of-a-kind. While you can’t re-trigger the feature while inside, each time you land one of the Piggy scatter symbols, you’ll be awarded one extra free-spin, so you can be playing for quite some time. 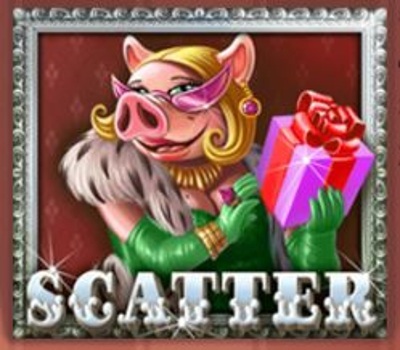 Piggy Riches is known to be quite high-variance, and while the feature does appear to trigger quite regularly, hitting a decent win is a different story; expect a few dead features now and again – hit it hard, however, and you could easily walk away with 200X + wins, and with a 360,000-max coin win available… it could be thousands more.